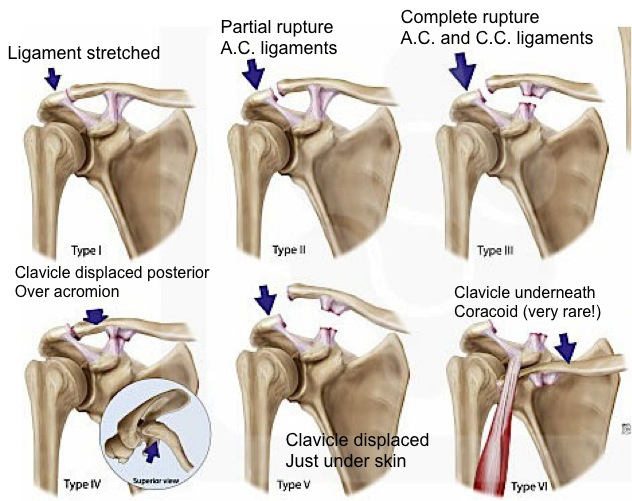 Definition: Sprain or tear of the acromioclavicular (AC) and coracoclavicular (CC) ligaments. Mechanism: Typically a fall on or direct blow to the acromion with the humerus adducted, forcing the acromion inferiorly and medially relative to the clavicle. True incidence unknown because many with mild injuries do not seek medical attention. Most common type of shoulder injury amongst young athletes. 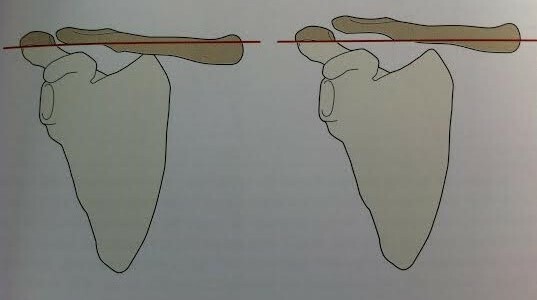 Point tenderness to palpation over the AC joint and, depending on degree of injury, the CC joint. 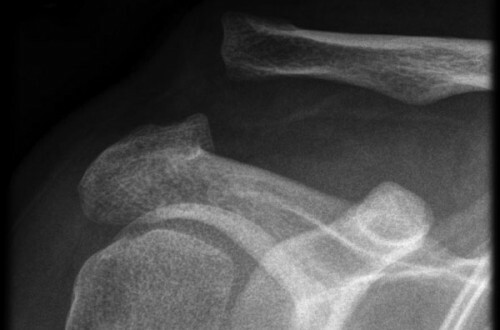 Prominence of the clavicle and associated swelling in more severe injuries. Arm typically held in adduction against the body with poor range of motion of the shoulder secondary to pain. Scarf test – patient elevates arm to 90 degrees and adducts across the front of the body, elicited pain in the AC joint is a positive test. Type I: AC sprain, unaffected CC ligament; normal x-ray or slight AC widening. Type II: AC tear/CC sprain, inferior border of clavicle elevated but not displaced beyond superior aspect of acromion; normal CC space. 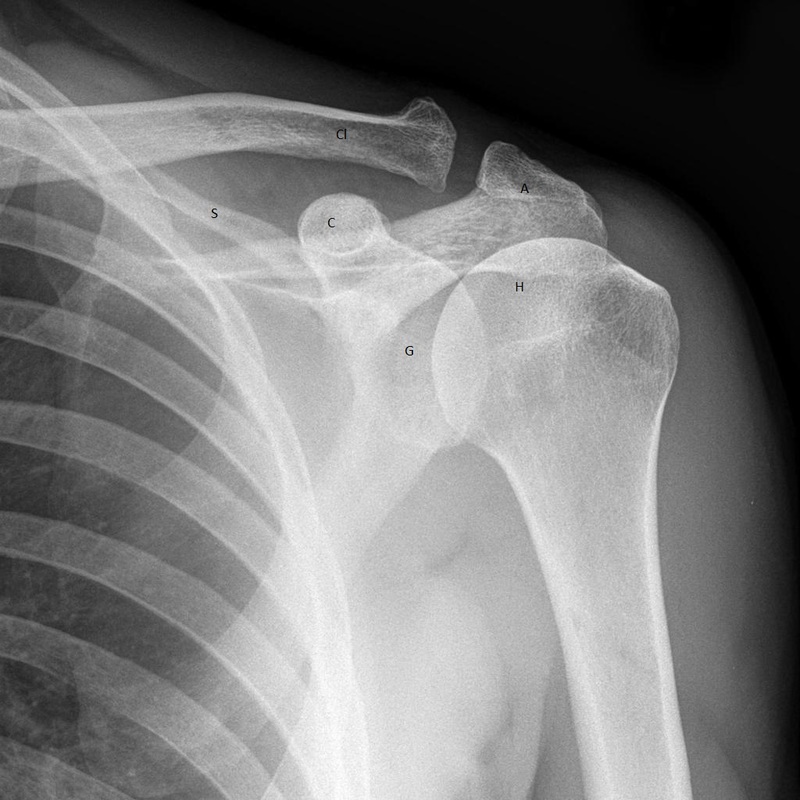 Type III: AC tear/CC tear, inferior border of clavicle beyond superior aspect of acromion, CC displacement but less than twice normal joint distance. 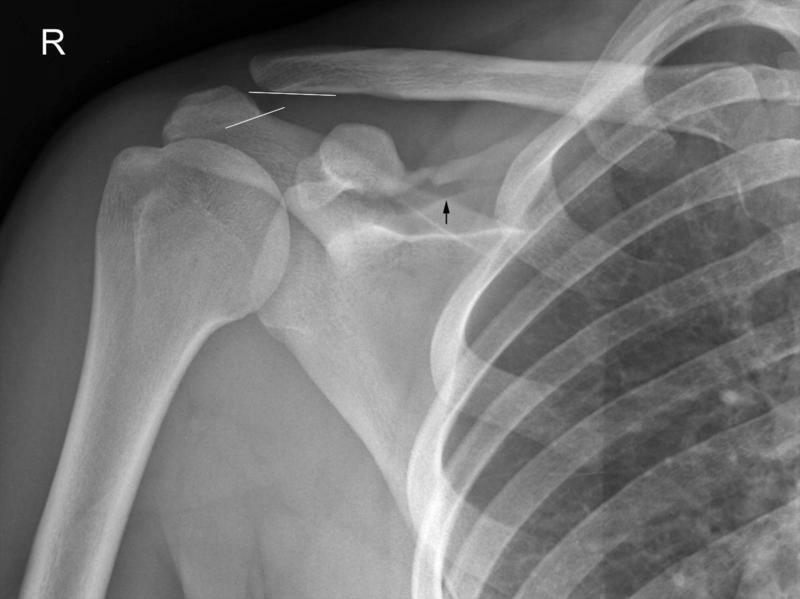 Type IV: AC tear/CC tear, lateral clavicle posteriorly displaced into trapezius (see on axillary view). Type V: AC tear/CC tear, CC displacement greater than twice normal joint distance, may cause tenting or ischemia of overlying skin. 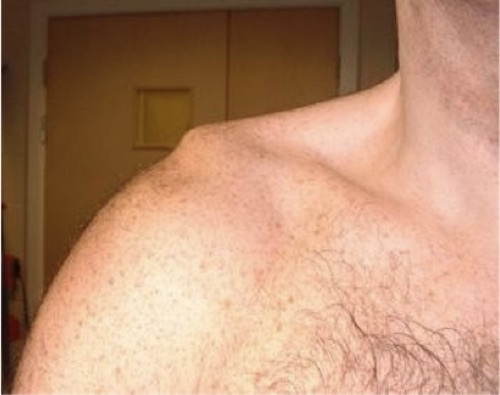 Type VI: AC tear/CC tear, clavicle located beneath acromion or coracoid; very rare. Normal AC joint distance <5mm. Variation exists but with clinical suspicion any measurement >8mm is concerning for injury, comparison to normal contralateral side also useful. 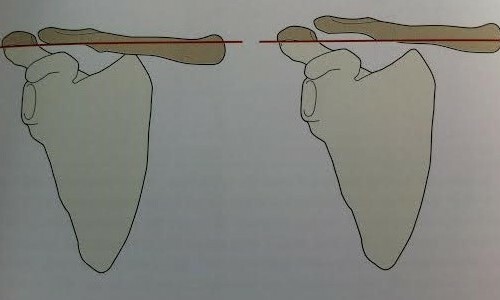 Normal CC joint distance 10-13mm. 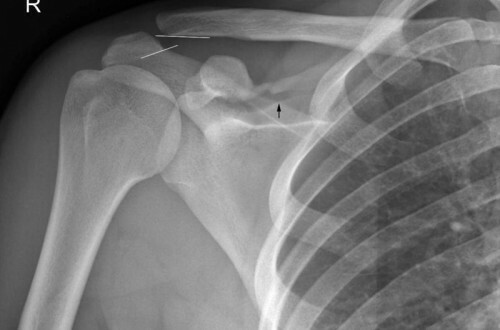 Displacement measured from superior border of the coracoid process to the inferior border of the clavicle. A Zanca view, an AP with 10-15 degrees cephalic tilt, may help better visualize the AC joint by eliminating overlying bony images when evaluating for type II injury. 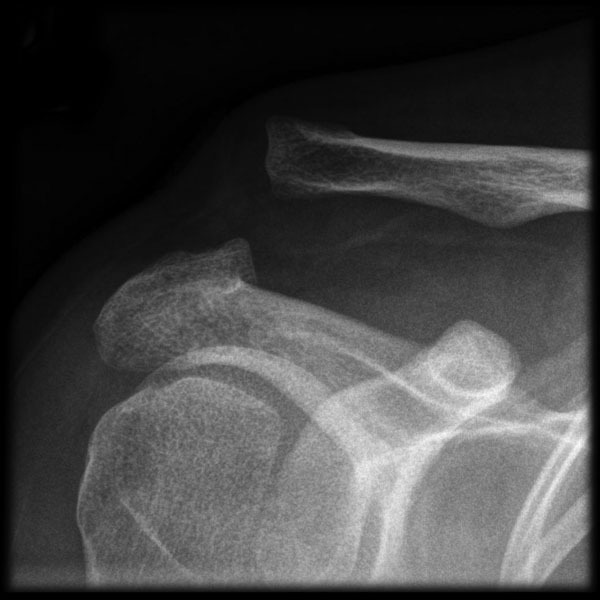 Grade II AC Injury - Also seen are associated scapular and coracoid fractures. Type III injuries: Ensure orthopedic follow up for possible operative management. Type IV-VI injuries: Uncommon and are frequently in the setting of polytrauma. They require careful examination to evaluate for signs of vascular injury. Orthopedic consultation recommended for evaluation and operative planning. Most Type I-II injuries regain full range of motion by 6 weeks and can return to normal activity by 12 weeks. Mild type I injuries may require only a few days away from usual activities. Type III management often dictated by patient age and lifestyle with majority being non-operative Spencer 2007. If operative management deferred patient will usually remain in a sling for 2-3 weeks. Return to full activity following surgery for more severe injuries is usually 6 months. Diagnosis of AC injuries is frequently made on physical exam; lack of x-ray findings does not rule out a type I injury. Recommend early range of motion in commonly seen mild AC joint injuries. Recognize severe injury patterns and carefully evaluate for vascular compromise. Baxter A. Emergency Imaging: A Practical Guide. Stuttgart, Germany: Thieme; 2016: 412-413. Montellese P, Dancy T. The acromioclavicular joint. Prim Care. 2004; 31:857. Quillen D et al. Acute Shoulder Injuries. Am Fam Physician. 2004; 70(10): 1947-1954. PMID: 15571061. Raby N, Berman L, de Lacy G. Accident and Emergency Radiology: A Survival Guide. Philadelphia, PA: Elsevier Saunders; 2005: 68-89. Rockwood CA Jr et al. Fractures in Adults. 4th ed. Philadelphia, Pa: Lippincott-Raven; 1996. Spencer EE Jr. Treatment of grade III acrimioclavicular joint injuries: a systematic review. Clin Orthop Relat Res 2007; 455:38. PMID: 17179783.